Market Outlook - September 2016 | Rocco & Associates Wealth Management, Inc. This summer has been anything but quiet. 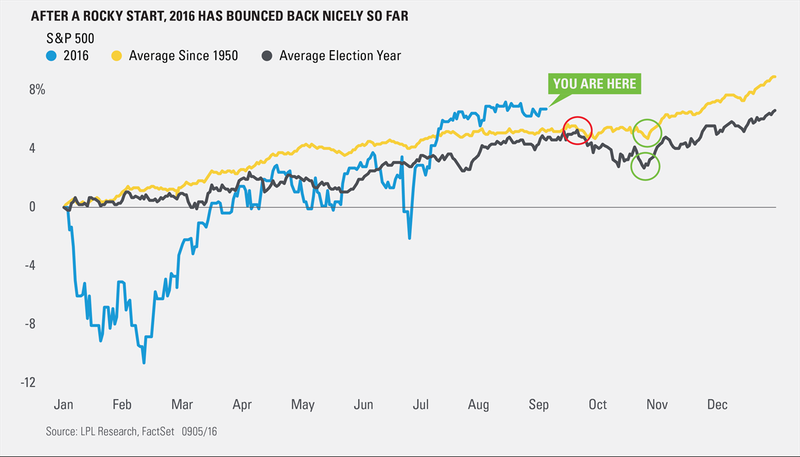 Between the June Brexit vote, several headline-grabbing jobs reports, the winding path of oil prices, and all-time highs for stocks, there has been a lot of activity to absorb in these past couple of months. Not to mention that we are in the midst of a U.S. presidential election and the speculation that comes with it. Here are some of the highlights as we sift through the headlines and digest all the data. To start, stocks have been on a roll lately. July saw a new all-time high for the S&P 500 (the first since May 2015) and a 3.7% gain for the month—putting the market on its first five-month winning streak in two years. Looking ahead, there are several potential market-moving events on the calendar. The Federal Reserve (Fed), European Central Bank (ECB), Bank of England (BOE), and Bank of Japan (BOJ) all meet in September. In its mid-July meeting, the Fed shored up the market’s confidence that the next rate hike was likely to come after the election, while markets expect the ECB, BOE, and BOJ to do more.